This Stone Blade is Universal dry and wet cutting blades. 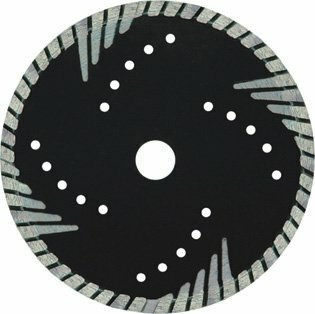 Unique design of segments allows ideal removal, better cooling and protecting core, and provides extremely fast cutting, the cooling holes on the core of the Hand Saw blade can reduce the temperature during cutting. The manufacture art of Stone Cutter Blade is sinter hot-pressed, diameter of Masonry Saw Blade is ranges from 4 inch to 14inch. Normally , the Diamond Stone Cutting Tools' arbor size is 22.23mm or 25.4mm. Looking for ideal 125mm Turbo Bevel Diamond Saw Manufacturer & supplier ? We have a wide selection at great prices to help you get creative. All the 125mm Turbo Bevel Cutting Disc are quality guaranteed. We are China Origin Factory of 125mm Segmented Bevel Circular Blade. If you have any question, please feel free to contact us.